Through the years you may have heard the advice, “Don’t put all your eggs in one basket” as a way to make sure you’re covered if things don’t go as planned. Often we can have tunnel-vision when we focus in on our goals, but if we’re honest, we can admit that life’s little hiccups happen more often than not. Flexibility and being able to see the big picture are key to staying on track. Achieving a healthy lifestyle is no exception to that proverb. When thinking about “getting healthy” many people automatically go to exercise and diet in their minds. However, healthy living is impacted by more than just how often and how long we raise our heart rate, and what foods we consume. Here are a few tips to broaden your approach to healthy living. Keep in mind, these will have a greater impact if they are accompanied by proper eating and exercise habits. However, they can also be first steps on your path to healthier living. We live in a society full of instantaneous solutions. Hungry? We can get our hands on prepared food fast, and many times, we consume it even faster. When you were a child were you ever told that you should chew each bite of food 32 times? Turns out, while that number is arbitrary, chewing your food more really does make a difference. Nutritionists recommend 20-30 chews per bite. There are multiple benefits of this. First, the more you break down your food by chewing, the less has to be broken down in the stomach and intestine; and that can help reduce bloating and constipation. Plus, since it’s already broken down when it reaches those organs, your body is better able to absorb the nutrients from the food. Additionally, eating at a slower pace gives more time for your stomach to detect that it is full and send the signal to the brain. Tracy Lockwood Beckerman, a registered dietitian in New York City suggests: “Challenge yourself to take at least 15 to 20 minutes to finish a meal, because that is how long it takes for your gut to tell your brain it’s full.” Once your brain knows you are getting full it can signal you to stop, thereby preventing overeating. Lunch break is being used as a time to catch up on to-dos or returning emails. Individuals feel it’s more important to multi-task then to set aside that time for a meal. In a remote work environment, relationships may not be developed, so people choose virtual connections and scroll social media while they eat – even if they are working in the office that day. In manual labor jobs, lunch is a must for rest and refueling the body. In contrast, for white collar jobs, lunch may not be seen as being a necessity. In fact, some may have come to view it as a sign of idleness. Unfortunately, despite it being widely practiced, eating at your desk is not a healthy habit according to nutritionists. In cases where desktop dining is taking place due to work tasks, the stress hormone cortisol may be increased. This hormone can negatively influence the digestion process and decrease the nutrients that are absorbed from food. Additionally, when you are focused on work, a computer or something else instead of your meal, you may not pay attention to WHAT you are eating. This can lead to both poor choices as well as overeating. Whenever possible, plan ahead to set aside time devoted to your meal. It gives your body and brain a break. It may seem logical that multi-tasking while eating at your desk is a time saver. However, a 2008 University of Illinois study revealed the opposite is true. They found after a long period of focusing on a single task, the brain is actually less able to focus and perform. The study found that even brief distractions (for example, a lunch break) can actually increase your ability to focus on that same task. If you must work through lunch, plan and prepare yourself a healthy meal. This prevents poor choices at a vending machine and allows you to control serving sizes, not the take-out restaurant. While getting healthy is associated with staying active, without adequate sleep you may actually feel less energetic. Today’s fast paced schedules of work, school, sports, family, social activities and obligations makes it easy for the sleep schedule to be low on the list of priorities. Most people need 7-8 hours of sleep each night. In addition to just feeling tired and sluggish (and sometimes grumpy), lack of sleep can have an effect on blood sugar levels. Sleep impacts the balance of hunger and satiety hormones. Those who do not get enough sleep may also have reduced levels of leptin, a satiety hormone which regulates energy. According to Beckerman, this leads to both increased cravings of sugary, sweet foods as well as the “bottomless-pit feeling where you eat and eat, but don’t feel full”. If you are unable to get a full night’s rest, sleep experts recommend trying to take a nap. In our fast-paced world, it may seem counterintuitive; however, a 25-30 minute nap can be an effective energy-booster to increase your productivity for the rest of the day. Experiencing some stress is a part of life. It’s true, there is good stress and there is bad stress. Feeling excited about a vacation or seeing a friend, can be good for you. However, chronic stress – stress that interferes with your daily life, feels inescapable or makes you feel out of control – can have many negative effects both mentally and physically. Chronic stress has been linked to depression and anxiety, gastrointestinal problems, damage to muscle tissue, suppression of the immune system, high blood pressure and cardiovascular disease among other conditions. Therefore, it is vital that each individual develop a method of managing stress. Some people use exercise as a stress reliever and it is quite effective. However, that is not the only option. Other stress relieving activities include journaling, meditation, cooking, gardening, crafting, music and the list goes on and on. What is important, is that you find what works for you and then practice stress reduction regularly. Overindulging in alcohol can have numerous negative effects on your health, according to research studies. Consuming more than 1 drink per day for women or 2 for men, may contribute to poor sleep, overeating and reduced cognitive function, along with premature aging. Additionally, it is linked to an increase in risk of both cancer and high blood pressure. Plus, these drinks contain “empty calories.” Many cocktails contain large amounts of sugar which can contribute to weight gain and blood sugar issues. In addition to impacting inhibitions, alcohol also reduces the body’s ability to use the hormone leptin which reduces food intake and regulates energy metabolism. “This imbalance influences our powerful brains towards convincing us that we want more carbohydrate-heavy and greasy meals,” Beckerman said. Most people have no issues with having a drink from time to time, but if you want to minimize the negative effects alcohol can have on your health, attention must be paid to not over-indulge. While diet and exercise is a big part of a healthy lifestyle, it’s not the ONLY component. 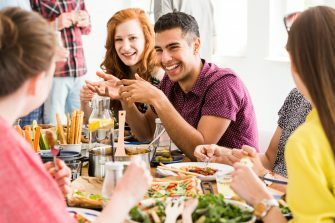 Getting enough rest, reducing stress, limiting alcohol, and even simply paying attention to how fast you eat can all contribute to a healthier life. Whether or not you currently exercise regularly, try to implement some of these tips. Maintaining a healthy lifestyle takes commitment, but it doesn’t have to be hard. Slow down, and take care of yourself. If you have questions regarding diet, exercise, or other factors that affect your health, discuss them at your next chiropractic appointment. If you don’t have a chiropractor, you can find one convenient to your home or work at https://www.tnchiro.com/find-a-doctor/.